Women from Wales’ Somali community said they have been “persecuted” and have called for changes to female genital mutilation rules. Campaigners said FGM no longer happened in Wales, but health workers continued to accuse innocent families. Health workers must report children they think are at risk to social services and report evidence to police. The Welsh Government said its rules were “sensitive to culture, race and religion”. FGM is illegal in the UK and figures show there were fewer than 17 cases in under 18s recorded by Welsh health boards last year. The cases, revealed in a BBC Freedom of Information request, were in children who had been born outside the UK and not in established British-African communities. 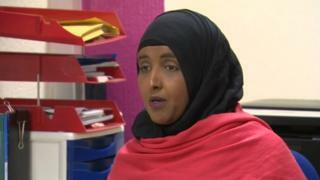 Campaigner Zainab Nur said 30 years ago FGM was widespread in Cardiff’s Somali community but the practise in their community has stopped. She said safeguarding rules meant that innocent families are still being accused by health workers of doing FGM to their children. “It was always known that 99% of girls were done, but we’re continuing to be persecuted for the crime of our ancestors,” said Ms Nur. “I was thinking why are we being interrogated?” she said. “Why are we being asked these intrusive questions? “My sister was shocked, my mum was mortified by the accusations.” The family had to take the girl for a physical examination with a specialist before doctors agreed that no FGM had taken place. 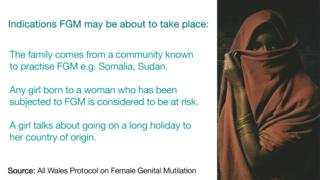 It is a story that campaigners in Cardiff’s Somali community say is not uncommon in Wales since 2014, when a new law meant all health care workers were obliged to report any children they suspect to be at risk of FGM. 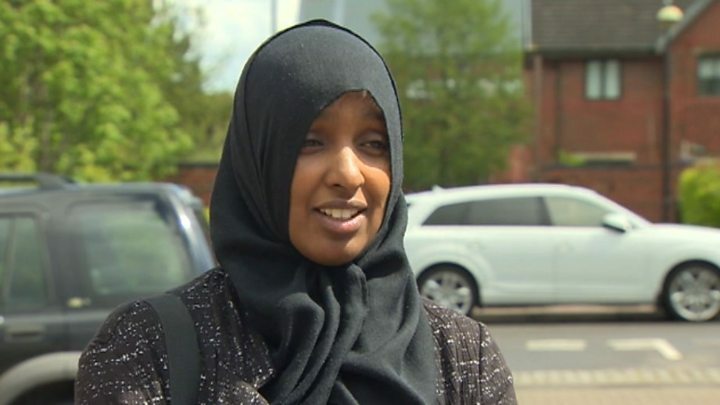 Another woman ‘Hamda’ was shocked when a health visitor referred her to social services after she had a baby girl, even though she told the health worker she had no intention of doing FGM to her. “I felt as though my opinion didn’t matter,” she said. Cardiff and Vale Health Board said it did not discriminate between race or culture as “mandatory questions are asked of women of all ethnicities”. But health professionals said the rules around spotting children at risk were vital. Janet Fyle, from the Royal College of Midwives, said: “Once a child has FGM you can’t go back and correct that, so we need to protect the children – not at all costs, we need to do so sensitively.